If you’re involved in competition shooting, you may be interested to know what the best 3-Gun Competition scope is. Stick around for this guide as we highlight the 3-Gun Competition, what you would be looking for in a good competition scope, and our top five picks for the best 3-Gun scopes. 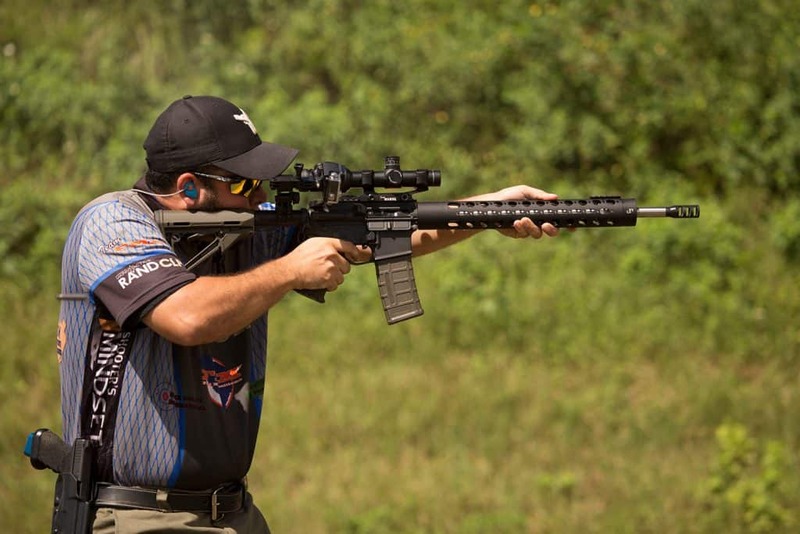 The 3-Gun competition is possibly the fastest growing shooting competition out there. It consists of a structure of different courses in which you make your way through the course shooting three different weapons, a rifle, pistol, and shotgun, at different stages. You will shoot both long range and close range targets from different positions. The goal is to hit the most targets in the least amount of time with each firearm. It is a super exciting and fast-paced sport, and constantly changing as no two matches run exactly the same courses. Although you can have optics on your other competing arms, we will focus and compare scopes for the tactical rifle sections of the course. The scope magnification power options that you choose for this competition are extremely important. The targets are never the same. Some are long-range and some are close-range. Some are stationary and some are moving targets. The best option scope for this competition would be a low variable power range scope. The most popular choice is a 1x to 6x power. 1X is no magnification, and works greatest for quick target acquisition and using both eyes open in the event of tactical style targets that are close-range and moving. 6X power is powerful enough to get a good shot out to 800 to 1000 yards for a long-range shoot, if you even needed to go that far out. For the most part, these lower variable power range scopes are also going to be much lighter weight than a scope with crazy high power range features because they require less glass optical layers. The 3-Gun is all about fast pace, so getting on target quickly is key. Some people use a red dot sight, but as far as a scope goes, you want something with multiple aiming points at can be adjusted easily between long-range and close-range. Mil-dot or hash mark, or BDC reticles are probably the best options. These reticles have multiple aiming points set up on a vertical plane and are great for putting the right aiming point at the correct distances for greater accuracy and to reduce the guess factor. Many people also find an illuminated reticle to be very helpful. The only thing to keep in mind about a BDC reticle is that it is very specific to the bullet caliber, load and shooting conditions that it was zeroed at. Eye relief is the distance that your eye has to be from the ocular lens in order to see a full view of your image through the scope. Ideally, you want a nice long eye relief so that you do not get cracked in the face by the scope with the recoil. Plus a longer eye relief assists you in those both eyes open scenarios. A larger eye box is another important feature that you want for your scope. The larger the eye box the bigger range of positions your head can be in and still see through the scope. This is very important when you’re shooting rapidly and moving around for different targets. For the 3-Gun Competition, a second focal plane scope is much better than a first focal plane scope. First focal plane is where the reticle size changes with the increase or decrease in magnification and second focal plane always stays the same size. You would want a second focal plane that stays the same size because with first focal plane scopes on lower power magnification settings the reticle is very hard to see, and at higher power settings the reticle can overpower and block out the target. Below you’ll find a more detailed review of the 5 scopes we’ve chosen for 3 gun competitions. Any of these 5 scopes will make a great option for your competition shooting. A locking side illumination dial is located on the left side of the turret. This scope has 11 illumination levels with off positions between each setting, making it easy to find your preferred setup. Capped low profile turrets are quick and easy to adjust and are fully resettable to zero. A fast focus eyepiece allows quick and easy reticle focusing. The Vortex Optics Razor HD Gen II is a second focal plane 1-6x24mm riflescope that is perfect for short to medium range applications and quick target acquisition. The reticle is a JM-1 BCD illuminated center dot with eleven illumination levels and a locking side illumination dial on the left side of the turret. It has a fast-focus eyepiece for quick and easy reticle focusing and capped low profile turrets that are fully resettable to zero and easy to adjust. 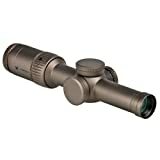 This durable scope is O-ring sealed and argon-purged to be waterproof and fog proof. The body is made of single piece aircraft-grade aluminum and Armortek coatings protect the lenses from scratches, oil, and dirt. The lenses are fully multi-coated with anti-reflective coatings to increase light transmission for optimal brightness. Along with all this, it has a nice long 4-inch eye relief. Customers of this scope love the durability of it, the huge field of view, long 4-inch eye relief and the outstanding glass quality. Having the red dot style illumination in the reticle is an appealing feature as well. One problem customers have found with this scope is that it is pretty heavy and relatively expensive. 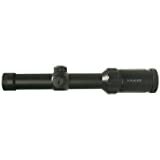 The Bushnell Tactical Elite is a beautifully designed, durable scope that is made of one-piece tube construction for ultimate strength and is argon purged. The fully multi-coated optics enhance light transmission and image clarity and are treated with Rain Guard HD anti-fog technology to keep the lenses clear. 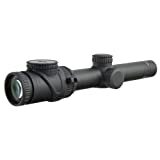 This scope features an adjustable magnification range of 1-8.5x with a first focal plane, ignition illuminated mil-hash marked reticle designed for ranging, holdover, and windage correction. T-Lok locking windage and elevation turrets hold adjustments in place and eleven illumination settings ensure reticle visibility in any ambient light conditions. This scope also comes with a limited lifetime warranty. Customers of this scope like the nice, clear glass, great turrets and nice illumination that can be turned off between each brightness setting. The 1x power setting is true and precise for close distances and the 8.5x setting can easily handle a 500+ yard shot. Customer complaints include that the scope is very heavy and the reticle at 1x power is nearly invisible without illumination. Also, the tube body diameter in a non-standard 34mm making scope rings hard to find and expensive. The Weaver Tactical is a high-quality, close to intermediate range scope offering 1-5x magnification power with a true 1x setting. The body is a solid one-piece, argon purged tube with fully multi-coated lenses and extra hard coatings on the exterior lenses. The turrets are reset-to-zero tactical-style turrets with a spare battery storage compartment incorporated into the turret caps in case you need to change out batteries for the illuminated reticle. An aggressive knurling pattern has been constructed onto the power adjustment to reduce finger slippage. Overall, compared to other 3-Gun scopes, the weaver also comes at an excellent price point. Customers seem to like the clear optics on this scope, the extreme precision, and the small, lightweight size is also a big plus. Also, I must mention the price point is appreciated. Conversely, it seems that the daylight illumination settings are consistently a little lacking. Also, the eye box is very small. The Kahles Optics scope is a second focal plane, 1-6x powered scope with a 24mm objective lens. It is tough, waterproof and fog proof with capped turrets and an illuminated reticle. Kahles claims to have the most refined zero stop and dial reset available with a second rotation indicator on the elevation adjustment. 26 Mils of overall elevation adjustment in just two rotations and precise indexing adjust for extreme distances and back to zero incredibly fast and accurately. Unique and innovated parallax adjustment under the elevation turret is designed superior to all other designs for right or left-handed shooters. What this means is less time required to engage multiple targets as you won’t have to break your shooting position. Customers of this scope describe it as a top-notch 3-Gun scope with super fast sight acquisition. The only complaint I was able to find is that it’s quite expensive. The Trijicon AccuPoint is a 1-6x powered rifle scope that has several different reticle pattern choices available and has a non-battery powered illuminated reticle made with fiber optics for all ambient light conditions and tritium for low or no light conditions. The Trijicon AccuPoint is a second focal plane reticle scope, which is the preferred style for the 3-Gun competition. An illumination dial allows you to control the brightness level of your fiber optic aiming point, and when dialed up to 6x power the MOA cross-hair reticle can be used as your own personal BDC reticle. 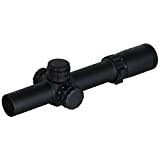 Customers of this scope have commented that it is a true 1x optic and that the fiber optic is much brighter than the battery powered aiming points of some of the other scopes out there. They love the clear glass and say that the performance is absolutely the best! Negatively, it seems that when people have issues with this scope it has something to do with the reticle. Some report that you can’t see the green dot at all when it’s in tritium. Other say that the fiber optic is good only if the light’s shining directly above the gun, otherwise you can’t see it at all. What is the max distance I’d be shooting for the 3-Gun? – More than likely you would not be shooting out much further than 500-600 yards, though I have heard of someone have to do a 980-yard shot. Most of the shooting will be close to mid-range. This is why most people go with 1x-6x power variation scopes, so you can quickly move and acquire new targets at very close range, but can go out to those longer shots as needed. I hope this guide has been helpful to you in learning a little bit about the 3-Gun competition and what would be the best scopes for it. If nothing else, hopefully, you have learned a bit more about what features you would want to look for when shopping for a good 3-Gun scope. I whatever you choose, remember that speed and accuracy are the keys to this competition, so get a scope, get out there and start plinking. The 3-Gun is a fast-paced sport that welcomes newbies at shooting as well, so if you’re not a third generation marksmen, that’s OK. Most of these folks will help you out to success, and before you know it, your grand-kids will be second generation marksmen! Happy shooting! If you enjoyed this article check out our one on the 300 blackout scopes.